Ridge Craft’s Sundance Series is packed with gorgeous cupolas, including the Franklin-style louvered model. This beautifully simple louvered cupola is available in several color choices and is designed to accommodate up to a 10/12 roof pitch. Whether you need a 24-inch by 35-inch piece or a 72-inch by 99-inch piece, we have you covered. 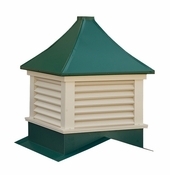 These affordable and dignified Franklin roof cupolas are ideal for any rooftop that needs a custom look. If you’re not sure what will work best for your structure, simply call us. We specialize in helping our customers find the perfect match, and we’d love to walk you through your options.